This sireline has died out but is represented today on the mare side of several notable horses. It came to Poland when Abu Argub II OA was imported. 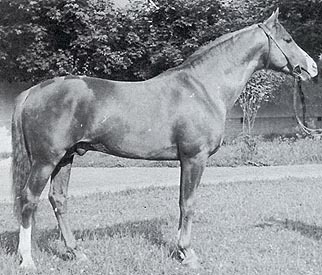 Abu Argub II OA was a bay stallion bred by the Shammar Gizra and purchased in 1898 by Prince Roman Sanguszko the Younger from a turk in Warszawa. His only purebred get was Athos 1899 who in turn sired Almanzor 1909 out of Mlecha III. Almanzor also carried the blood of such notables as Pharaoh OA, imported to Poland from Crabbet Park, and the mare Mlecha OA who was one of the precious mares imported to Jarczowce in 1845. 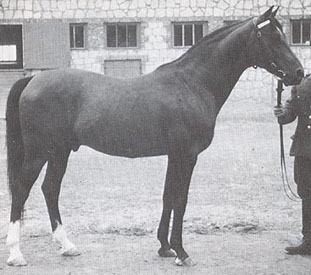 The only son of Almanzor who left any significant get was Rozmaryn 1935 out of Dziewanna (also dam of Piolun and Skrzyp, both removed to Russia during World War II). Rozmaryn himself was a very good individual who left excellent daughters. He had a good race record, 2/9(3-3-3) and left several excellent racehorses. 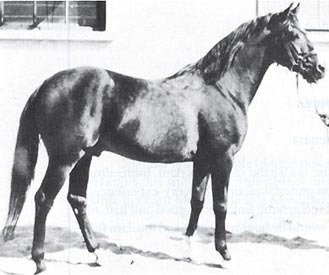 Beside Rozmaryn, Almanzor sired the mares *Przepiorka 1934 out of Jaskolka II (exported to J.M Dickinson, USA, in 1937), *Rybitwa 1935, also out of Jaskolka II (exp Babson, USA) and Rozeta 1935, who left among others Rusznica 1955 imp Sweden. 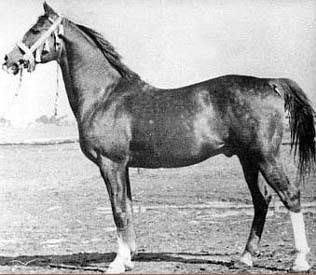 Rozmaryn sired one son used in Poland, Dramat 1958 out of Dyska. Dramat left no son and only two mares: *Feta 1970 out of Ferenike born in Poland and Morgiana 1968 out of *Morwa, an in-utero import to Sweden. Another of Rozmaryn's sons, Ordynek 1953 out of Orda, was imported to Sweden in the group from Cirkus Knie which also contained Nureddin. Ordynek sired only one son, Ordymir out of Emerita, before he died and Ordymir did not breed on. Another son of Rozmaryn, Fanfaron 1954, died before he could be used at stud. He was a good racehorse, 5/33(12-9-14), including six stakes. The mares sired by Rozmaryn were Fanfarona 1953 and Fregata 1957 out of Fanfara 1945 (full sisters of Fanfaron 1954), Znachorka 1953 out of Zahabu, *Bandera 1955 out of Bajadera, *Druchna 1957 out of Darda, *Elokwencja 1957 out of Ela and Galopada 1953 out of Galka (exp W. Germany). 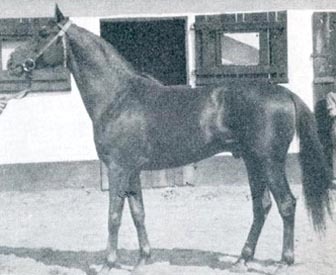 He also sired the mare Grazyna 1955 (full sister to Galopada) who was exported along with her dam to East Germany where they both made an important contribution to the breed. This sireline may not exist as a paternal line anymore but it is still very widespread through the excellent mares it has given. Many horses from this line are noted for excellent performance abilities.